Help Save A Hacker… 48' Cruiser! Yes A Hacker. So, I was up early Saturday morning checking on woodyboater.com (no kidding, I really was) when the phone rang. It was 7AM and the lady on the other end introduced herself and told me that her late fathers boat had sunk yesterday (Friday), was raised and then hauled to a local public boat ramp. A truck was coming at 11AM to haul it to “the scrapyard”. I asked what kind of boat it was. She said it was a Hacker. I caught my breath, composed myself and asked what year and length it was. She said it was a 1947 48′ Cruiser. Her dad had lovingly restored it and it hadn’t been used since he passed. I had an 8AM commitment and was then scheduled to spend the whole day in Oregons beautiful wine country. I was torn but I was committed, so I called my two best woodyboater friends and asked for help. We had to save this boat. Chris Finks and Chuck Kellogg were on the scene barely an hour later. My wife asked me what was wrong and I reluctantly told her about the boat. She looked me square in the eyes and said “go get the boat. You can meet us in wine country later and we’ll pick the car up tomorrow.” I reminded her that it was a ‘free’ 46 foot boat. She suggested I have it shipped to my shop. In a strange turn of events, I declined her offer and decided to let Chris and Chuck check the boat over and report back. iPhones are a great thing. I called the daughter back and urged her to buy another day for the boat so I could get a look at it. 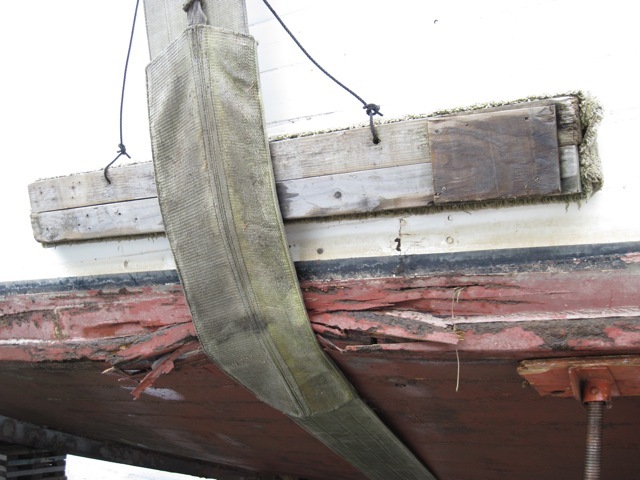 In the meantime, Chris was e-mailing me photos of the sunken boat. She was at the public dock with the stem firmly planted in the sand and still full of water. The boat reeked of fuel and oil. The ceiling had oil dripping off of it. This boat had truly sank in its mooring. I stuck to my plan and had a wonderful day wine tasting. As luck would have it, another guy came by and “claimed” the boat. He had it towed to a local marina and hauled out. I got a look at her Sunday morning and the following photos are what I saw. What an amazing boat, what and amazing designer, what an amazing history, but man, she was gone. I spent quite a bit of time in her just looking at the mess of soaked stuff. That was after I inspected the bottom and found virtually no good wood. This boat hadn’t been hauled out in a long time. While inside I was looking for some “tell tale” Hacker signs. I couldn’t find anything substantial except for a soaked Hacker burgee. After a couple phone calls I got an estimate of about $35k for a new bottom from the waterline down, including keel, stem and chines. That’s just the beginning, though, and who knows how the side frames are and what it will take to re-power, re-plumb and re-wire this beauty. 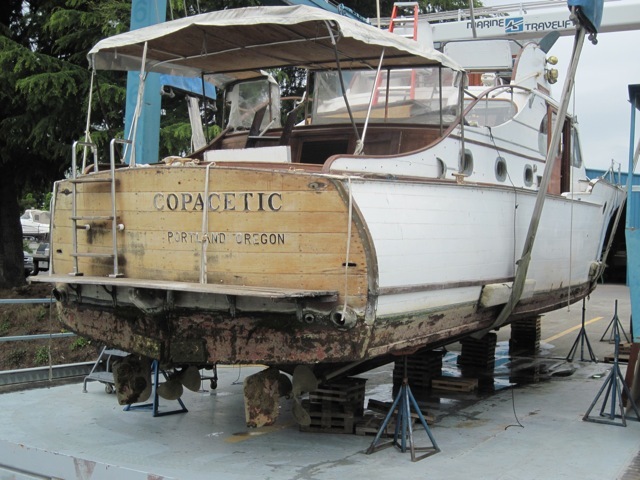 Needless to say, I have stepped away but would love to help this special boat find a proper home. If you’re interested in it please send me an e-mail at [email protected] I will direct you to her current caretaker, who is also overwhelmed with the scope of the project. 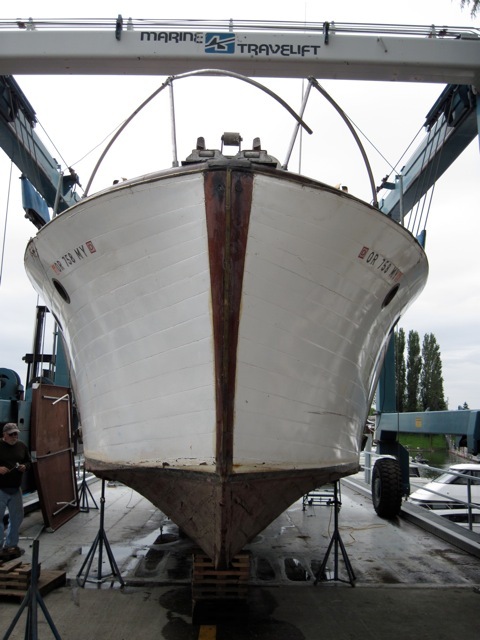 The boat is currently moored in Portland, Oregon. Thank goodness that boat is on the other side of the country. Distance dictates limited access which inhibits my involvement. There are too many other boats to be saved between here and there. Good Luck. I look foward to seeing it finished and floating. A Classic example of when copecetic isn't. Mike – thank you for NOT calling me! Wow what a project – financial suicide, but think of the recompense – "I saved a Hacker, and all the those bragging rights are mine"
Really, though this would take a special person with special skills and special facilities in which to do the work. Very few such people exist, and if Kellog won't touch it, it must be beyond reasonable hope. Good luck, though, in this most noble pursuit. Hey, I think Texx could use a cruiser, and another restoration project! John Rothert says: truely a sad story, but we can't save them all…. I know this was not a careful haulout, since the boat was shot, but all you cruiser guys should take a good look at how the travelift crushed the chines. Yesterday read an issue of Pwr&MtrYhct cover to cover (hey, I was bored to tears sitting in the ferry line!) After seeing 94 pages of molded plastic, how can one not be moved by these classic John Hacker lines; what a graceful hull shape! Since many of those plastic 48'ers are in the $750K range, I think restoring the Hacker is actually a good value. Unless you like anonymous look-a-like skylounge wrap-around floating apartments that is…. Just imagine the admiring looks you would get parked up next to one! I say go for it Paul! Maybe it could be Woodyboaters West Coast location? It would be total write off!! Whatdya say, Matt? When I was a kid growing up on the Mississippi Gulf Coast, there were people who spent years on old boats dumping their money and finding more rot the next day. Many devorces because of it. I said then that they should have been taken to the grave yard down the bayou from the shipyard but most sunk at the dock. 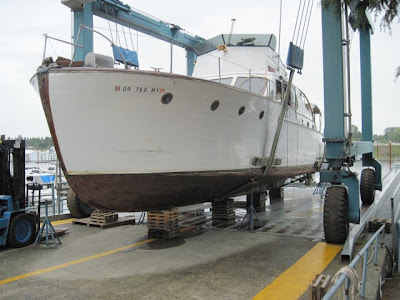 I have completely rebuilt a 1955 Chris Craft 18' Continental and that was a chore in the garage. Can't possibly see what one would want with a boat that would cost $35,000 for a bottom for starters. some things just need to scrapped or the ones who have plenty of money can spend it and still have a old boat. Good luck. After several calls from my buddy Mike Mayer and Chuck Kellogg, we ended up going back three times to the Hacker and see what we could do to help or perhaps save another casualty of our heritage. Boats such as these are disappearing at an alarming rate with a tough economy and deferred maintenance and I wish there was something that could do. They have historic status for houses, too bad there weren't tax credits to save maritime heritage? "In a backhanded and perhaps unintentional way, you have perfectly articulated the reasons we do what we do – because we WANT to have an old boat. We want to save them, if possible. That is the point, and you summarized it beautifully. I don't think you get it, but never the less, you did illuminate our persepctive nicely." Chris – good luck on that. I hope Mayer is involved! Maybe I'll come and see her in a few weeks when I am in Portland! It was one of those things that happened so quickly–and I might add quite messy–that it was not "logically illogical" to save her. I say logically illogical because that is the norm for old boats. As of yesterday, the Hacker was scheduled to be collected for scrap and hauled away. In short, it makes no sense from an economic point-of-view which many things of these nature seldom do. As I mentioned, I am too far down the road in the negotiations on another large cruiser to take on something this far deteriorated. Sad but true. Historic homes and landmarks worldwide are extraordinarily expense to restore and maintain, yet we do save them in more frequency than maritime heritage. Same for old cars. Seldom do ANY of those make sense to restore and keep, yet we do in higher numbers. So you see what I wrote yesterday was intentional. In the time or a bit before boats such as the Hacker were launched, our world has endured The Great Depression, World War II, and many other wars and economic calamities such as our current economic crisis. As a result, most of these vessels have not survived, falling victim to neglect due to cost of maintenance, age and market value. Many well-known brokers specializing in vintage boats are now no longer accepting cruisers as there is virtually no market for them. We are currently in a climate that is accelerating the demise of similar boats given the state of the economy and substantial investment required considering their advancing age. The Hacker was not immune and is now apparently the latest casualty that will require a large investment in time and money to keep her afloat. It is sad the Hacker was allowed deteriorate to the degree she had. Her owner did the best he could while living and then his heirs paid little attention and soon the Hacker became a liability. Vessels such as this deserve a better fate than being scuttled, but time was against her. The Hacker is perhaps too large project that too few would want to take on, let alone making a snap decision. And, believe me I thought about it…Do I “get it”? Be well and see you when you are in town Paul! 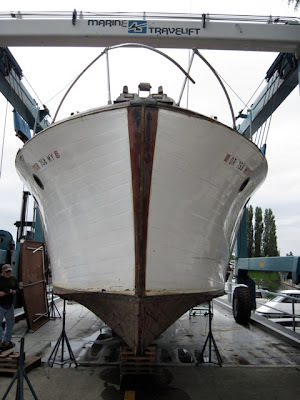 Just a side note from someone who appreciates beautiful old wooden boats, but has absolutely nothing of substance to add to the Hacker discussion: Mike Mayer, you have a wonderfully supportive wife to say, "go look at the boat – you can meet up with us later!" p.s. you sure do amazing things with wooden boats. Even a novice like me can see that. Oh god. Mike, you are no obliged to go do it.. It's part of the code..